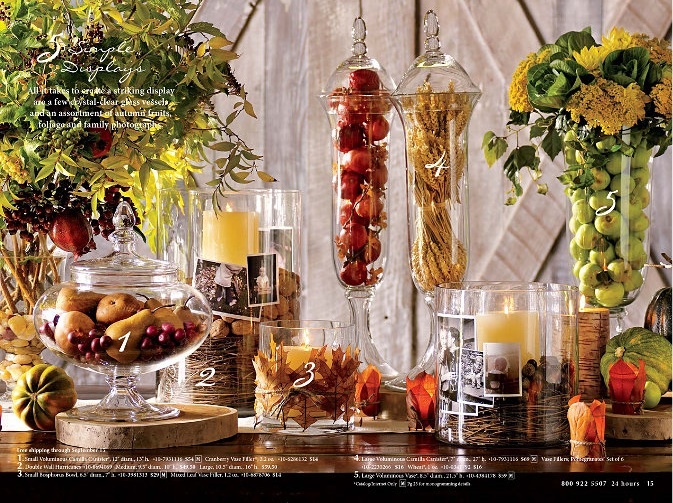 In my constant admiration of magazine spreads, I couldn't help but notice this gorgeous shot in the Fall Pottery Barn catalog. * Print off some favorite family photos in sepia tones (they don't even have to be great quality!) and line a large hurricane votive with them. Throw in some pine needles from your yard under the candle to complete the "look." * Fill up taller vases with smallish apples, whether real or fake from somewhere like Target (you can find bags of them in the candle aisle). Top with inexpensive bouquets of seasonal flowers -- the whole arrangement will make the flowers seem much more expensive than they really were. * Tie fall leaves around a short votive with hemp rope from Michael's, and use a plain candle in the middle. Can't get easier than that! Have fun creating simple yet stunning displays at home for your holiday table!